Protected by the Cies Islands, the Ria de Vigo hosts the port of the largest city in Galicia. It is the fifth Spanish mainland port in cruise traffic. Receives an annual average of 100 scales and 200,000 passengers in recent years. 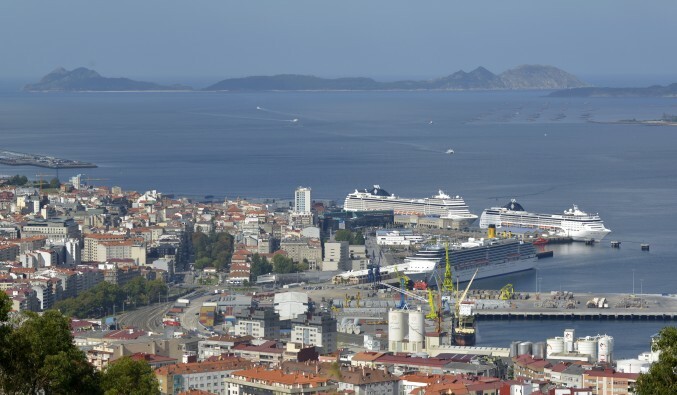 The Port of Vigo dedicates to cruise traffic 140,000 square meters. It also has two docks adding a thousand meters of berthing line with depths of 12 meters, joined by a wide pedestrian area with walkways, gardens, hotels and marina. Vigo can accommodate up to four large cruise ships simultaneously and have services available 24 hours 365 days a year. Transatlantic Pier was built to meet the demands of the great migration of the early twentieth century. Today in addition to the docking area, we can find the modern passenger terminal VIGO CRUISE TERMINAL (www.vigocruiseterminal.com) that provides boarding and disembarking services, baggage handling systems, tourist information, shopping area, currency exchange and wireless Free. The other cruise dock Vigo is the “Dock of Commerce”, 290 m of berthing line. Open for this service in 2010, the pier was formerly the area dedicated to loading and unloading fruit to the port.After a thorough architectural renovation, the new building retains its historic charm but offering new open spaces and modern facilities prepared for this new purpose. The Cruise Terminal, “The Port Platform”, designed to complement the Vigo Cruise Terminal, is ready to receive traffic scales with thousands of passengers. In 2014 the world’s largest ship, Oasis of the Seas, twin of Allure of the Seas, was scheduled twice in the port of Vigo, the largest city in Galicia. With capacity for 6,296 people and 361 meters long, the Oasis of the Seas offers some of the most exclusive facilities and unparalleled leisure, as the Aqua Theater. The Royal Caribbean International ship will stop at the Olive city, discovering for its passengers one of the most unique and representative tourist sites of the community. The cal at the Cruise Port of Vigo offers insights into some of the iconic tourist resources of Galicia, as its cuisine, combining tradition and modernity; its rich cultural heritage and especially its landscape and natural wealth. With one of the most beautiful estuaries of Galicia, Vigo opens the Atlantic Ocean and offers travelers a modern, cosmopolitan and dinamic city. A wide cultural offer, a strong industrial base and a wide range of leisure activities linked to nature are the strongholds of the so-called ‘Olive City’. The vicinity of Vigo is also home of some of the busiest tourist spots in Galicia as the Castro of Santa Tegra, located in the Minho’s natural border between Galicia and Portugal; the wine territory of the Protected Designation of Origin Rias Baixas, natural parks like Monte Aloia; enclaves like Illa da Toxa and Mondariz, emblems of Galicia’s potential as a territory linked to health tourism and wellness; cities like Pontevedra or Tui traversed by the Portuguese Way to Santiago complete the range of leisure and culture of an area characterized by ancient hospitality that for centuries has hosted the Jacobean pilgrims from all around the world. "More than 294 000 inhabitants turn Vigo into the largest city in Galicia. Arriving by cruise to the port of Vigo is an experience because the Cies Isl..."
Capital of seafood gastronomy The "Oysters Street" or "Calle de las Ostras" is a must for travelers who want a taste memory of its scale in Vigo. The best beach of the world Rhodes beach at Cíes Island is one of the most beautiful beaches in the world. The origin of the city: O Castro Dated between the second century B.C. and the III A.D. the site of O Castro is one of the most unique ways to approach the history of the city. The historic center of Vigo: the charm of “Casco Vello” Make a route of wine and tapas is the best way to get to know the idiosyncrasies of a neighborhood that keeps the essence of the old Vigo. Appointments with culture: Lovers of culture and museum will find a wide offer in Vigo.